This final chapter concludes the book. It begins by recapturing and analyzing five contentious issues confronting public higher education and university governance in Hong Kong. Next, it proposes a framework for understanding university governance as a political exercise in which university governors and senior management members lead their university by negotiating with internal and external actors over their competing priorities and interests. 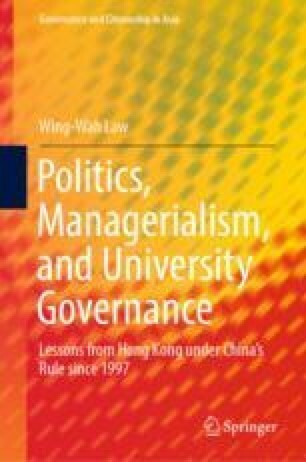 Finally, it explores the theoretical implications of this framework and highlights five important lessons for reconceptualizing and reconfiguring university governance in public higher education systems in societies like Hong Kong. Au, O. (2018, September 3). Daxue Zhidao Shizhi Buyi [The Dao of University: Unwavering determination]. Retrieved from https://zh-hk.facebook.com/CUHK.SU/posts/2009401419122257. Bessant, S. E. F., Robinson, Z. P., & Ormerod, R. M. (2015). Neoliberalism, new public management and the sustainable development agenda of higher education: History, contradictions and synergies. Environmental Education Research, 21(3), 417–432. https://doi.org/10.1080/13504622.2014.993933. Bland, B. (2017, November 1). Outcry as latest global publisher bows to China censors. Financial Times. Retrieved from https://www.ft.com/content/2d195ffc-be2e-11e7-b8a3-38a6e068f464. Cambridge University Press. (2017, August 17). Statement regarding content in the China Quarterly. Retrieved from http://www.cambridge.org/about-us/media/press-releases/cambridge-university-press-statement-regarding-content-china-quarterly/. Chinese People’s Political Consultative Conference. (2017, June 29). Dishierjie Quanguo Weiyuanhui Weiyuan Mingdan [List of the 12th National Committee Members, 2012–2018]. Retrieved from http://www.cppcc.gov.cn/zxww/2014/02/27/ARTI1393487184783942.shtml. Chou, O. (2014, March 19). Outgoing HKU Chief Tsui Lap-chee says academic freedom crucial. South China Morning Post. Retrieved from http://www.scmp.com/news/hong-kong/article/1451488/academic-freedom-crucial-teachers-hkus-outgoing-vice-chancellor-says. City University of Hong Kong. (2018, December 28). CityU president leads teams to Taiwan on sports exchange visit. Retrieved from https://newscentre.cityu.edu.hk/media/news/2018/12/28/cityu-president-leads-teams-taiwan-sports-exchange-visit. City University of Hong Kong. (2019). Professor Way Kuo. Retrieved from http://www6.cityu.edu.hk/op/bio_en.htm. Education Bureau. (2018, May 16). LCQ5: Issues relating to the promotion of “Hong Kong Independence”. Retrieved from http://www.info.gov.hk/gia/general/201805/16/P2018051600529.htm. Faculty of Law, The University of Hong Kong. (2015, October 4). Press statement on 4 October 2015. Retrieved from http://www.law.hku.hk/faculty/statement.php. Global Times Editor. (2014, June 30). Gao Qiyi Dayouxing Bu Fuhe Xianggang Liyi [Organizing large-scale demonstration on 1 July: Not in the interests of Hong Kong]. Huanqiu Shibao [Global Times]. Retrieved from http://opinion.huanqiu.com/editorial/2014-06/5039751.html. Hong Kong University of Science and Technology. (2018, January 18). HKUST appoints Prof Wei Shyy as fourth president. Retrieved from https://www.ust.hk/about-hkust/media-relations/press-releases/hkust-appoints-prof-wei-shyy-fourth-president/. Hong Kong University of Science and Technology. (2019a, January 8). HKUST appoints Prof. Lionel Ni as Provost. Retrieved from https://www.ust.hk/about-hkust/media-relations/press-releases/hkust-appoints-prof-lionel-ni-provost/. Hong Kong University of Science and Technology. (2019b). Professor Wei Shyy. Retrieved from https://www.ust.hk/president/. Lau, S. (2015, November 26). Fourth leak from University of Hong Kong council meetings shows president supported liberal scholar’s bid for post. South China Morning Post. Retrieved from http://www.scmp.com/news/hong-kong/education-community/article/1883389/fourth-leak-university-hong-kong-council-meetings. National People’s Congress. (2014). Xianggang Daibaiotuan Daibiao Mingdan [List of the Hong Kong delegates to the 12th National People’s Congress, 2012–2018]. Retrieved from http://www.npc.gov.cn/delegate/dbmd.action?id=d5. Tai, Y. T. (2018, December 12). Closing submission of Tai Yiu-ting (D1). Retrieved from https://www.facebook.com/BennyTaiHK/posts/1009265205933907. Tierney, W. (2018, December 5). Academic freedom goes on trial in Hong Kong. University World News. Retrieved from http://www.universityworldnews.com/article.php?story=2018120706510564. University of Hong Kong. (2017, December 15). The University of Hong Kong appoints Professor Xiang Zhang as the 16th vice-chancellor. Retrieved from https://www.hku.hk/press/news_detail_17263.html. University of Hong Kong. (2018). Provost and deputy Vice-Chancellor: Professor Paul K H Tam. Retrieved from https://presidentoffice.hku.hk/smt/dvc.html. Wenweipo Editorial. (2016, January 12). Jianchi Xingzhi Youxiao De Teshou Xiaojianzhi [To persist in the effective system of chief executive as ex-officio chancellor]. Wenweipo [Wenwei News], p. A3. Retrieved from http://paper.wenweipo.com/2016/03/21/WW1603210001.htm. Wong, W. K. (2014). Reflecting upon the research assessment exercise in Hong Kong: A cultural economy’s perspective. Cultural Studies@Lingnan, 38(1). http://commons.ln.edu.hk/mcsln/vol38/iss1/5/.